Inspired by nature, Nordic color kitchens are the ultimate mix of pale tones with hues of sea and sky. 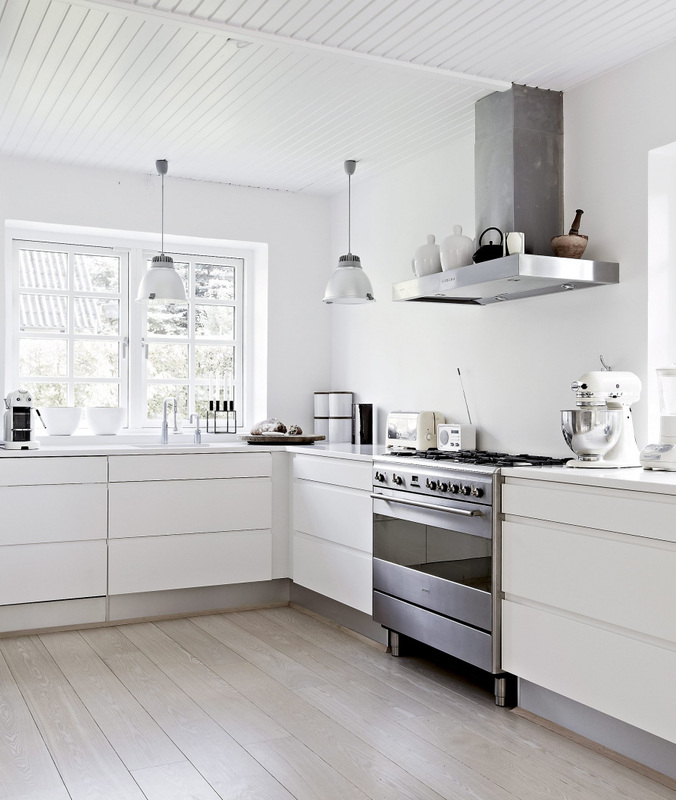 The Belgian kitchen aesthetic has been touted on many blogs but Nordic color kitchens are lesser known. Derived from Swedish, Danish and Finnish décor these are based on a mixed neutral palette inspired by nature. 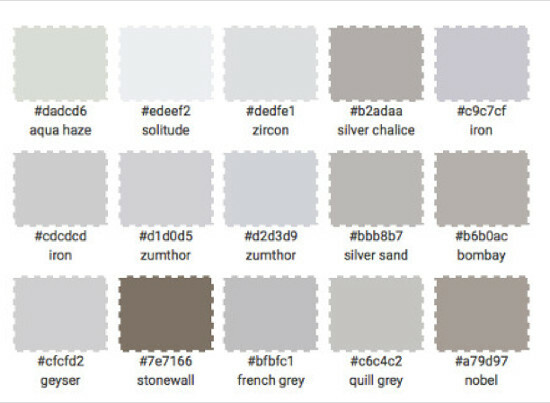 Essentially, the color schemes are derived from the colors of snow, ice, sand, sky, sea, earth, ash, wood, rusted metal, charcoal and the midnight sky. 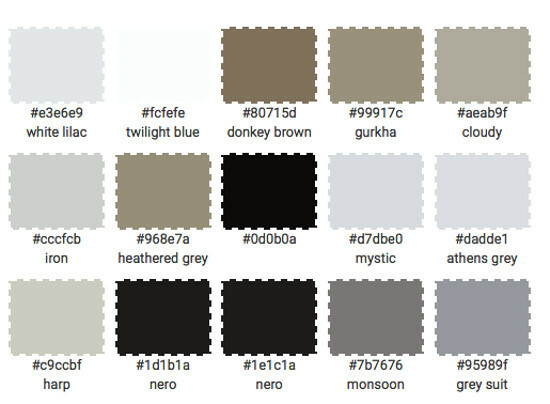 That plays out as a range of whites, off-whites, sandy beiges, wood tones, pale to medium blues, light to darkest grays, and black. Natural wood — unstained and unvarnished — is often a key element. 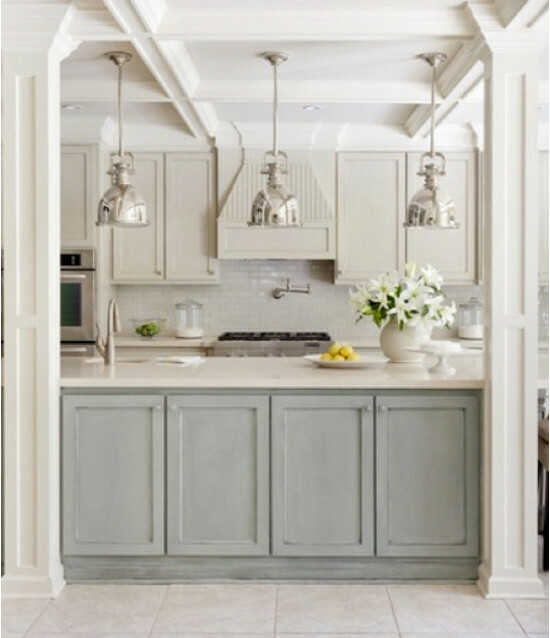 One of the best examples of a neutral kitchen I’ve found [top], this one mixes shades of pale to medium gray, combined with white, cream and a muddy green-gray. Although the subway tile backsplash and floors are white, various grays mixed with natural wood on the Gustavian style table top and the benches makes for a subtle tone-on-tone blending. 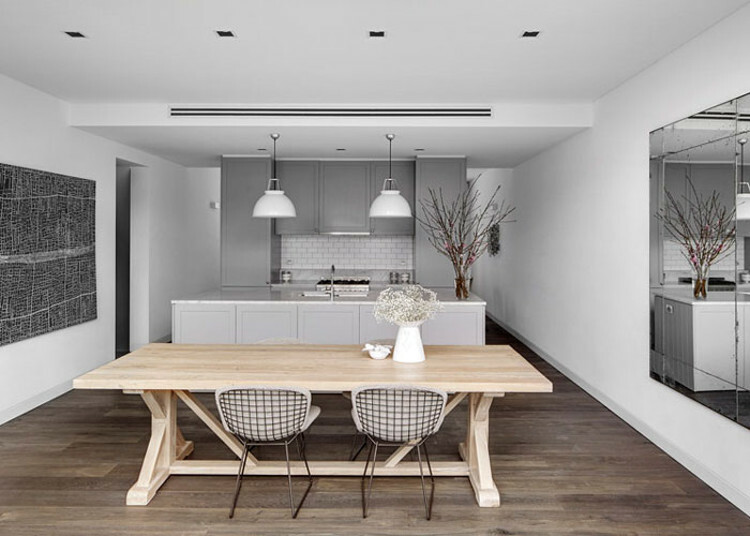 With cool white walls, gray cabinets, Carrara marble counters, and black and white art, this kitchen would feel drained of color were it not for the warmth of the ash table and gray-washed oak floors. Since the neutral color palettes are not always obvious, I used the Big Huge lab color generator tool to create ASE (Adobe Swatch Exchange) color palettes for this kitchen.It’s interesting to see how the darker hues in the floor boards turn up in the palette. Note the pinkish, almost fleshy, tones in the ash table. 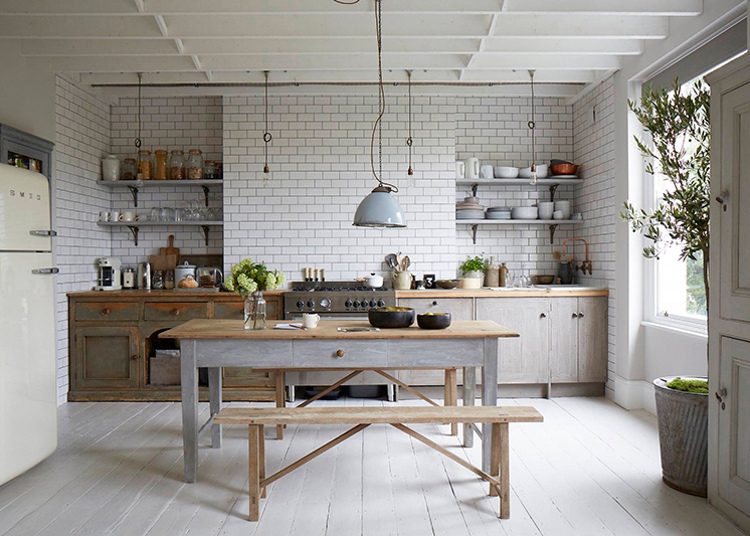 Lightest and most modern of all the kitchens, this one could well qualify in the all-white category. The pale wood floor makes it distinctive. The kitchen’s palette is ultra simple but most of it remains in the realm of muted colors which can be mixed together easily. White, taupe and black are pulled together and nicely coordinated in the cement-tile backsplash in this Nordic kitchen. The white-painted floor helps to keep the entire room bright while the black cabinet wall adds drama. The Damask Tile Kitchen we found in Sweden several years ago has a similar palette but a much darker, heavier look overall. Lightness is an element of the Nordic look and even with a black wall, this is a great example. 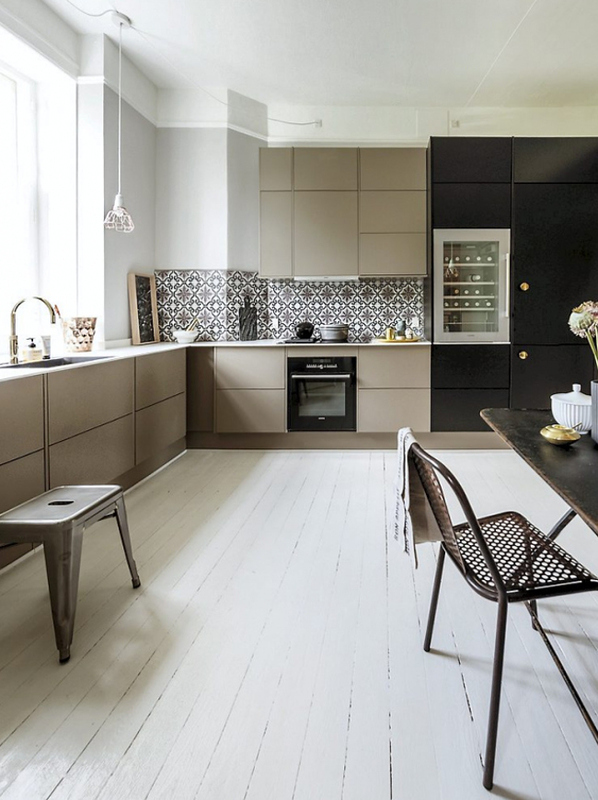 An exceptionally active palette for a neutral kitchen comes from the high contrast from nearly white to nearly black. 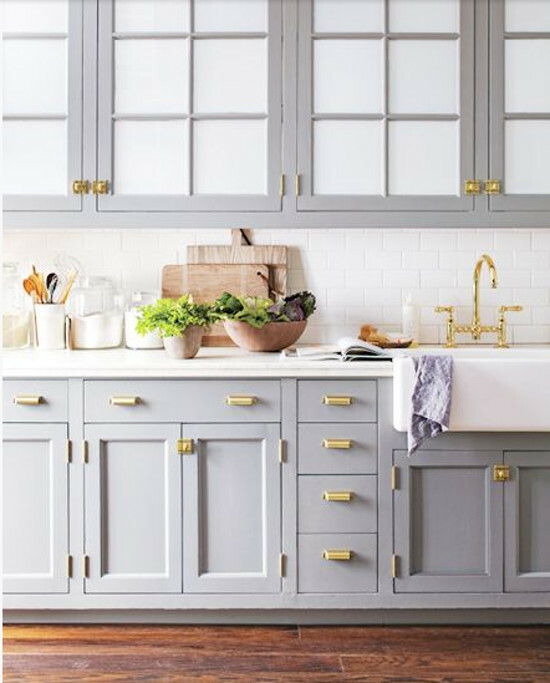 Warm metals — such as these brass pulls and faucet — keep a trendy gray and white kitchen from feeling flat. 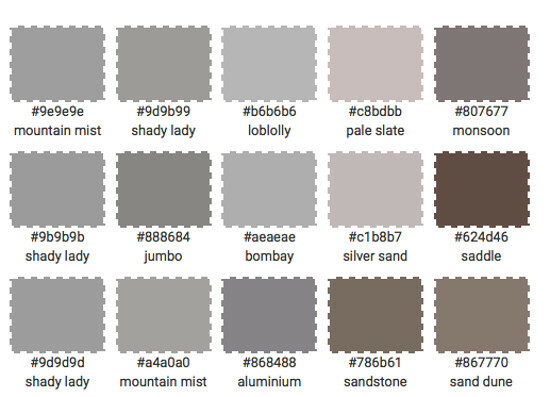 Martha Stewart used this example as a way of updating the gray kitchen. For me, the brass functions in the same was as natural wood. American kitchen designers are picking up the brass enthusiastically, as we’ve noted in our Touch of Brass post. 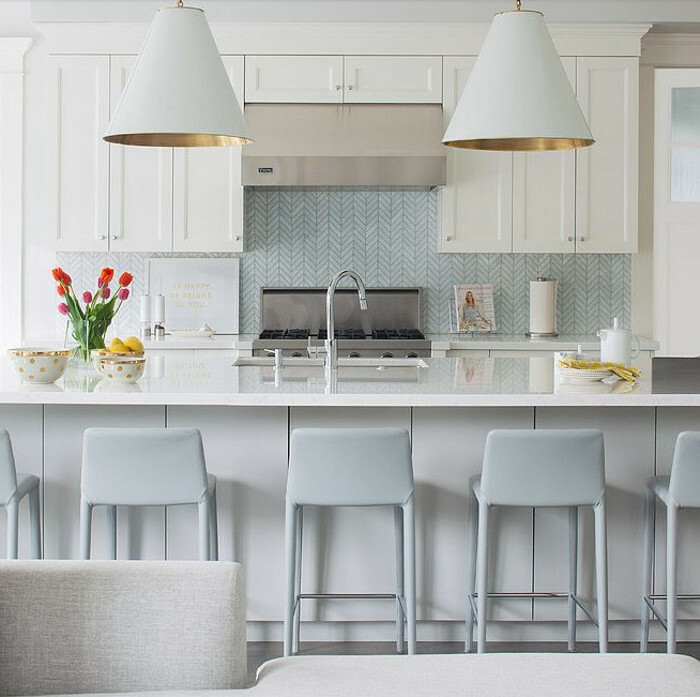 A tone-on-tone kitchen by Tobi Fairley shows the range from white, to sand, to a greyish-seafoam green on the base cabinets of the island. Silver tones in the pendant lights add some glamour. A color scheme like this one is typical of painted Swedish furniture. Pale blue-green worked into a subtle herringbone pattern tile back splash sets the winter sky theme for this kitchen. The sweetness of the color is not as forceful as the mints or blues used in the mid-20th century. the Goodman pendants from Circa lighting are handsome and notable. 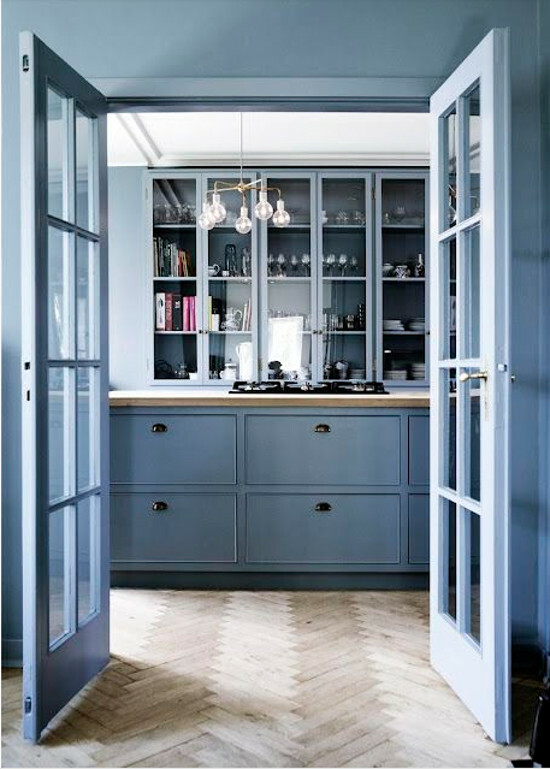 Yes, this is a blue kitchen but it also could be considered Nordic because this particular blue is so typical of the hue used in 18th and 19th century Scandinavian painted furniture. And the natural oak herringbone floor, along with a natural wood counter, restrains and distinguishes it. There is no mistaking this as anything but a Nordic look. A quick comparison with the French Blue Rooster Kitchen immediately shows why. The blue hue used in this kitchen goes by many names. 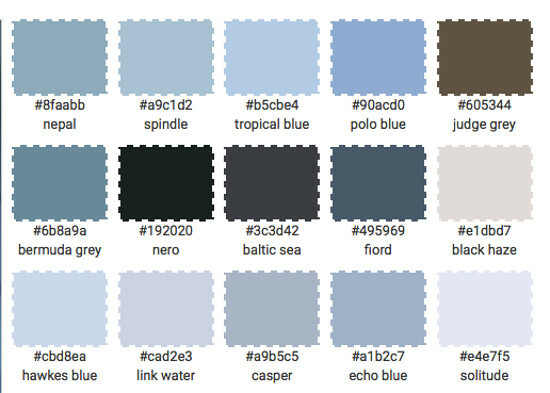 For me, it is sky blue but I’ve also seen it called cornflower and baroque blue. Adobe offers some other names.